Microsoft's Outlook software is used by countless businesses around the world, so it's only natural that Salesforce wants its own software to play nicely with it. On Tuesday, the CRM giant announced a big step in that direction. 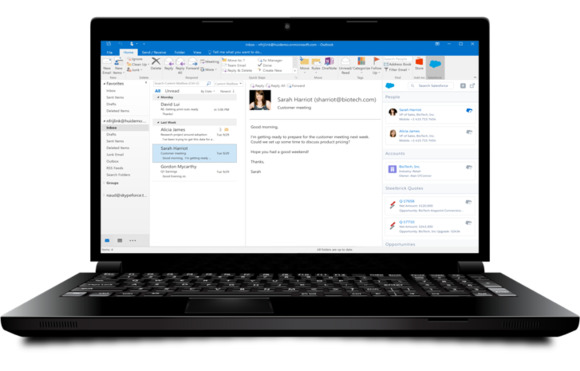 The latest in a series of integrations resulting from the two-year-old partnership between Salesforce and Microsoft, Lightning for Outlook is an add-in that promises to let salespeople tailor their inboxes with smooth access to customer relationship management (CRM) data whenever they need it. The average sales rep spends more than 70 percent of each week sending and responding to email, according to Salesforce. CRM and email software, meanwhile, have remained largely separate, meaning that reps have had to toggle between them. "Millions of our users use Office every day," said Greg Gsell, Salesforce's director of Sales Cloud. "We want them to be able to access CRM or Office data seamlessly -- it shouldn't make a difference how they want to work." Toward that end, the new add-in taps Salesforce's Lightning Components, a set of reusable building blocks of code, to let users "snap" new functions into their Outlook inbox. That additional functionality can come from Salesforce itself -- a sales rep could update a price quote with SteelBrick CPQ from within Outlook, for instance -- or from partners. A feature called Lightning Sync, meanwhile, enables users to automatically sync contacts and calendar events across Outlook and Salesforce, saving the time they'd otherwise spend doing it manually. "When you update a contact in Outlook, it's reflected in Salesforce and on your mobile device," Gsell said. "All devices and teams are immediately kept up to date." The Lightning for Outlook add-in is now available via the Office Store at no additional cost to all Sales Cloud users. Lightning Sync is available at no extra cost to users with a Sales Cloud Lightning Enterprise Edition and above. Lightning Components Framework in Outlook will be generally available in the fall of this year; pricing will be announced at that time. "The Lightning user experience fits very neatly inside Outlook, and that means it interacts as natively as anything within Outlook itself," said Joshua Greenbaum, principal analyst with Enterprise Applications Consulting. "It's pretty slick." The integration is a win-win for both Microsoft and Salesforce, Greenbaum added. "A lot of these Salesforce accounts will never be won over to Microsoft Dynamics CRM, but this allows those Salesforce users to have a really good reason to be Office 365 users," he explained. For Salesforce, meanwhile, it broadens the number of potential users in any organization. "That extension of user licenses is on the top of the to-do list for any Salesforce sales rep," he said. Ultimately, though, "the real trick is in the net new customer deals," Greenbaum added. Now that both Salesforce and Microsoft Dynamics CRM have Outlook integration, "they're head to head," he said. "That's taken off the table as a differentiator, and it becomes a different kind of horse race." This story has been corrected to clarify that the new Salesforce integration is with Outlook and not just Outlook.com.